Ever since its initial founding back then in 1978 by Gianni Versace, Versace has become luxury fashion company that produces not only clothing products, but also various wear and accessories and also perfumes. Now, talking about Versace’s perfumes, you may have heard that the company had just released a new fragrance for men some time ago. The fragrance, inspired by and deeply connected to Greek mythology, is launched with the name of Eros Versace. The fragrance is named after Eros, a god from Greek mythology. Eros is the son of the goddess Aphrodite. Eros is the god of love. Well, if you have been familiar with the brand Versace, you may not be surprised to see the reference to Greek mythology anymore on the company’s product, since the brand itself has taken the goddess Medusa as its symbol to adorn various products that the house has created and produced. 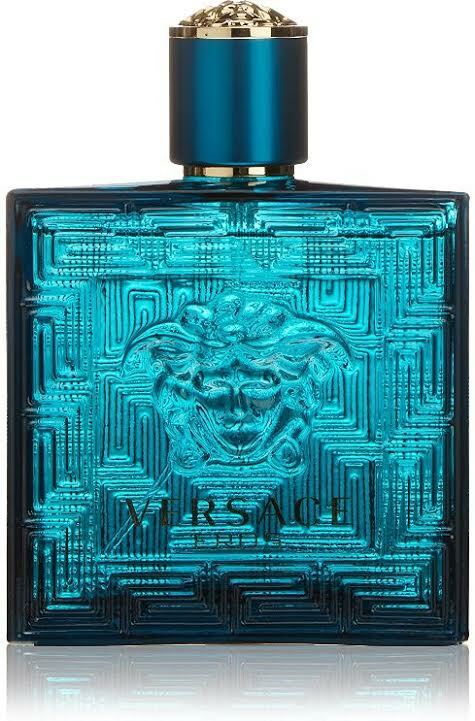 Eros Versace was crafted by the perfumer Aurelien Guichard of Givaudan and premiered in 2012. To hint you how great this perfume is, Donatella Versace even claimed Eros Versace to be the true DNA of Versace house. Everything that this fragrance represents: ancient Greece, antiquities, and mythology, all are major aspects of Versace. Eros Versace comes in a dark blue box packaging that features the company’s logo at the center, along with a golden font that showcases the product’s name. Inside the box, you can find a luxurious turquoise rectangular bottle. The color and the engraved pattern breathe a Mediterranean aura. It absolutely looks premium and elegant. Eros Versace is a fragrance for a strong and passionate man, a man who is the master of himself. It evokes the perfection of a male body with the allusion of Eros, the god of love. Love, passion, beauty, and desire make the key concepts of this elegant scent. It also projects strength, masculinity, and independence. The scent can be described as fresh, charming, a little bit woody and also a little bit spicy and oriental. The most noticeable notes are the coolness of the mint oil that is combined with green apple and Italian lemon to add some refreshing citrusy tones. Furthermore, the heart provides a soothing warmth that is created by the Venezuelan ambroxan complemented by geranium flowers to add a fougere twist. Eros Versace opens with the cool and refreshing top notes of mint oil, green apple, and Italian lemon. The mint oil is quite strong that the note remains solid after a prolonged time. As the effect, the mint oil note makes this Eros Versace to be very fresh. The scent then develops the middle notes that consist of tonka bean, geranium flowers, and Venezuelan ambroxan. As mentioned before, the strongest notes here are the Venezuelan ambroxan and geranium flowers, creating such a soothing and comforting warmth with a fougere twist. Finally, the base envelops all the notes in a solid manner. The base notes consists of Madagascar vanilla, cedar, vetiver, and oakmoss. As the effect, the base smells quite strongly woody. The earthly warmth promotes masculinity in a smooth and elegant way. The silage and projection of Eros Versace are quite considerably heavy, so you may not need to apply it with too many spritzes. With Eros Versace, you will be able to easily and confidently show your presence in the room. Eros Versace is also a long-lasting perfume that it can last for about the whole day. With its unique and distinctive characteristics, Eros Versace makes an excellent choice for party and going-out. It is also good for other casual occasions. However, depending on the circumstances and your particular personality, it may not suit all professional purposes such as for going to work or meeting a client. Top Notes: mint, green apple, lemon. Middle Notes: tonka bean, ambroxan, geranium. Base Notes: madagascar vanilla, cedar, vetiver, oak moss. Check the best price for Eros Versace here!